I am the first to admit how very lucky I am to live in a place that many people visit on vacation. I’m a wand-wielding Potterhead and pass-holding Space Center nerd with golden brown flip flop tan tines. While I do enjoy the theme parks and beaches that tourists flock south to, it’s the wildlife and lush surroundings that feed my soul. My daily encounters with animals, including endangered and threatened species, are typical yet so very special to me. My new neighbors my first week in FL. 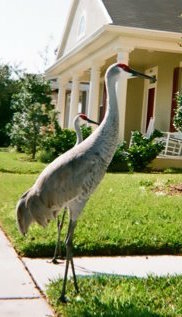 Since the very first day I moved to Sunshine State, the Florida Sandhill Crane has played a part in this chapter of my life. These birds are stunning to say the least. Their long, elegant lines and deliberate and graceful movements are mesmerizing, and their trumpeting calls are very distinct. 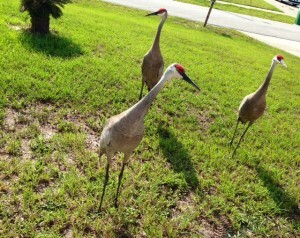 Sandhill cranes mate for life and stay in family groups. You’ll often see groups of 2 or 3. The female usually lays two eggs, and if both eggs in the clutch hatch and survive, you’ll see a family of four. Juveniles stay with the parents up to 10 months. Families of four make me especially happy, because they are currently a threatened species due to destruction of habitat. The Florida Sandhill Crane, or Grus canadensis pratensis, is a non-migratory sub-species of the sandhill crane family that only numbers around 3,000-4,000. You might see numbers increase during winter months, but those are actually the migratory cranes, Grus canadensis, from northern states. 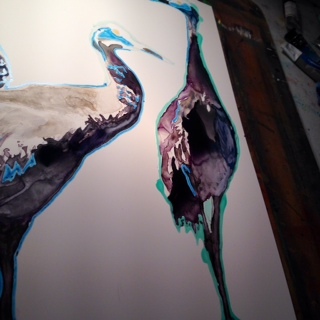 My Sandhill Cranes coming to life in the studio; watercolor on yupo. The sandhill crane is very secretive, selective, and protective of its nest location. This is another reason that habitat conservation is so vital. While it might seem like they are plentiful because we see them roaming neighborhoods, it’s very important not to feed them. Habituation to humans can lead to dependence, aggression, property destruction, as well as an increase in roadway deaths. My husband and I have a special place for them in our life. He used to say with a huge smile, “Bird family!”, every time we saw a specific crane group when we started dating, as they walked around the neighborhood where I lived. Now, we are visited daily by families of cranes in a home where we live as a married couple. Another incredible sight to see is the crane dance. These birds have a beautiful dance that they use for mating, social bonding, educating their young, and some scientist think at times it may even be play. If you follow my art, you know I like to also look to the historic esoteric symbolism and qualities attributed to animals. 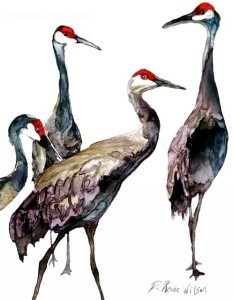 Some say Sandhill Cranes are totems of privacy and keeping your own counsel, protection of family, longevity, balance, grace, and the “dance of life”. For me, they are a symbol of knowing what is important to you and guarding it with all of your heart while remaining upright and balanced. This is not an easy task, but when we call out to those that love us, we will prevail, and we will dance in the process. 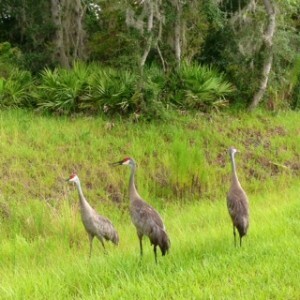 To learn more about Florida Sandhill Cranes, visit the Florida Fish & Wildlife Conservation Commission. * Update: This painting was exhibited and purchased by collectors during the Arts for Education exhibition at The University Club, and now resides in a private Orlando collection. Contact for information on acquiring a signed giclée reproduction of this painting, or visit NouveauNiche online to order a signed watercolor print. 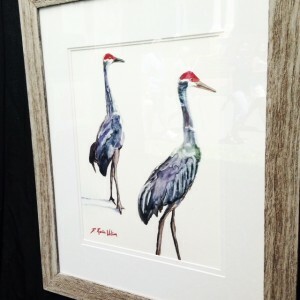 Just in time for the Mayfaire by-the-Lake, the cranes make another appearance in an original watercolor on Yupo. Contact to see detail photos or purchase inquiries.